For the 5th century "Roman kingdom" in Soissons ruled by Syagrius, see Kingdom of Soissons. Little is certain about the kingdom's history, as no records and few inscriptions from the time of the kings survive, and the accounts of this period written during the Republic and Empire are thought to be based on oral tradition. According to these legends, the Roman Kingdom began with the city's founding circa 753 BC, with settlements around the Palatine Hill along the river Tiber in central Italy, and ended with the overthrow of the kings and the establishment of the Republic circa 509 BC. The site of the founding of the Roman Kingdom (and eventual Republic and Empire) had a ford where one could cross the river Tiber in central Italy. The Palatine Hill and hills surrounding it provided easily defensible positions in the wide fertile plain surrounding them. Each of these features contributed to the success of the city. The traditional version of Roman history, which has come down to us principally through Livy (64 or 59 BC-AD 12 or 17), Plutarch (46–120), and Dionysius of Halicarnassus (c. 60 BC – after 7 BC), recounts that a series of seven kings ruled the settlement in Rome's first centuries. The traditional chronology, as codified by Varro (116 BC – 27 BC), allows 243 years for their combined reigns, an average of almost 35 years. Since the work of Barthold Georg Niebuhr, modern scholarship has generally discounted this schema. The Gauls destroyed many of Rome's historical records when they sacked the city after the Battle of the Allia in 390 BC (according to Varro; according to Polybius, the battle occurred in 387/6), and what remained eventually fell prey to time or to theft. With no contemporary records of the kingdom surviving, all accounts of the Roman kings must be carefully questioned. Whenever a king died, Rome entered a period of interregnum. Supreme power of the state would devolve to the Senate, which was responsible for finding a new king. The Senate would assemble and appoint one of its own members—the interrex—to serve for a period of five days with the sole purpose of nominating the next king of Rome. If no king were nominated at the end of five days, with the Senate's consent the interrex would appoint another Senator to succeed him for another five-day term. This process would continue until a new king was elected. Once the interrex found a suitable nominee to the kingship, he would bring the nominee before the Senate and the Senate would review him. If the Senate passed the nominee, the interrex would convene the Curiate Assembly and preside over it during the election of the King. 753–717 BC Romulus Myth of Romulus and Remus; founder of Rome; established Roman Senate, army, first religious institutions. 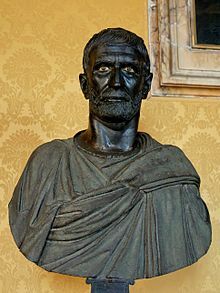 716–673 BC Numa Pompilius Established many of Rome's most important religious and political institutions; introduced twelve-month solar calendar. 673–642 BC Tullus Hostilius Defeated and destroyed Alba Longa; integrated the noble Alban families into the Roman aristocracy. 640–616 BC Ancus Marcius Established port of Ostia; defeated the Sabines. 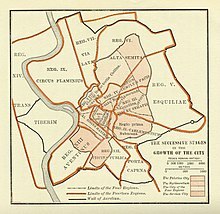 616–579 BC Tarquinius Priscus Expanded Roman hegemony over Latium; doubled membership in the Senate to 600; drained the Roman Forum, and constructed the Cloaca Maxima and the Circus Maximus. 578–535 BC Servius Tullius Established the Servian Tribes and the centuries; built the Temple of Diana and a new wall around the city; instituted the Compitalia. 535–509 BC Tarquinius Superbus Last King of Rome; overthrew Servius; conquered various Latin cities and established colonies; built the Temple of Jupiter Optimus Maximus; deposed and Roman Republic established. 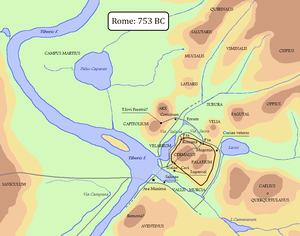 A map of Rome in 753 BC. Colors show topography, with green lowlands and red highlands. The Latin names of hills are included in all caps. A map of the City of the Four Regions, roughly corresponding to the city limits during the later kingdom. The division is traditionally, though probably incorrectly, attributed to Servius Tullius. The seven hills of Rome are shown in green, with Latin names. ^ Asimov, Isaac (1991). Asimov's Chronology of the World. New York: HarperCollins. p. 69. ISBN 0-06-270036-7. ^ a b "Titus Livius (Livy), The History of Rome, Book 1, chapter 8". www.perseus.tufts.edu. Retrieved 2015-12-09.